In 2018, we witnessed significant momentum in several hot areas of cancer research, including immunotherapy and precision medicine. Researchers have amassed exponential amounts of knowledge in these areas of scientific inquiry in recent years, and 2018 saw many of these gains culminate into innovative treatments for cancer patients. Overall, in 2018, the U.S. Food and Drug Administration (FDA) approved 18 new cancer therapeutics and expanded the use of 10 previously approved treatments to include new types of cancer. To highlight a few, last year, the FDA approved or expanded the use of five immune checkpoint inhibitors; since 2011, the FDA has approved seven checkpoint inhibitors to treat various solid and hematologic cancers. Last year, the FDA also approved the use of the CAR T-cell therapy tisagenlecleucel (Kymriah) for some patients with non-Hodgkin lymphoma; the second tissue-agnostic cancer therapeutic, larotrectinib (Vitrakvi), to treat patients whose tumors carry specific genetic alterations regardless of organ site; and the PARP inhibitors olaparib (Lynparza) and talazoparib (Talzenna) to treat BRCA gene-mutant breast cancers. The cancer research community has also been steadfast in its efforts to curb the pandemic of e-cigarettes use among youngsters, with the goal of protecting them from tobacco-related diseases. In response to an alarming increase in the use of e-cigarettes by youth (78 percent and 48 percent increase among high school and middle school students, respectively, between 2017 and 2018), on Nov. 15, 2018, the FDA announced that it will limit most e-cigarette sales to age-restricted, in-person locations, and plans to implement age-verification measures for online sales to restrict minors from buying flavored e-cigarette pods. Also noteworthy, in May 2018, Congress passed the Childhood Cancer Survivorship, Treatment, Access, and Research (STAR) Act, which was signed into law in June. The Act aims to support pediatric cancer research by expanding the collection of biospecimens and records, improving surveillance, and investigating pediatric survivorship. What major milestones do experts think we will hit in 2019? 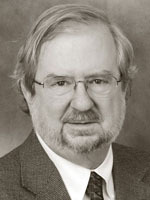 We asked Nobel Laureate, Fellow of the AACR Academy, and immunotherapy pioneer James P. Allison, PhD; AACR President-elect and precision medicine expert Elaine Mardis, PhD; and chairperson for the Minorities in Cancer Research Council of the AACR, Brian Rivers, PhD; to share their insights on progress expected in 2019 in the oncology field. In 2019, we will start seeing checkpoint blockade combinations come to the forefront, extending the range of cancers that respond to treatment, besides increasing efficacy and response rates, Allison predicts. “I think this is going to be done in a couple of ways,” he notes. One approach is by finding more combinations of immunological agents such as anti-CTLA-4 and anti-PD1/PD-L1 therapies. Other approaches include combinations with chemotherapy, radiation therapy, and genomically targeted drugs. “That is going to greatly improve responses for cancer patients,” he says. By combining checkpoint blockade therapies with agents that are toxic to the cancer cells, it is possible to prime the immune system, but the trick is in carefully choosing the right drugs, given at the right time, to truly optimize effectiveness, he adds. Allison says that it is crucial to study tissue samples from patients to determine why certain combinations work and why some don’t, and these studies should serve as a guide to find the right combinations. “That’s going to be the biggest thing this year,” he notes. While immune checkpoint inhibitors yield promising results in many patients and in different types of cancer, the responses are limited to roughly a third of cancer patients, and many patients who respond develop resistance to these treatments. “From my viewpoint, there are two types of resistance to immune checkpoint inhibitors,” explains Allison. One is innate resistance in some patients causing failure to respond, which can be overcome, in part, by combining multiple checkpoints or with chemotherapy, radiation, or other approaches. But there are also patients who do not respond because they have acquired defects in gamma-interferon (IFNγ) or beta-2-microglobulin (B2M) signaling, thus losing the ability to respond to the lytic events of IFNγ or the ability to present tumor antigens to immune cells, he says. “I think there are ways around that, involving the development of CD4-targeted agents, particularly using vaccines,” he notes. 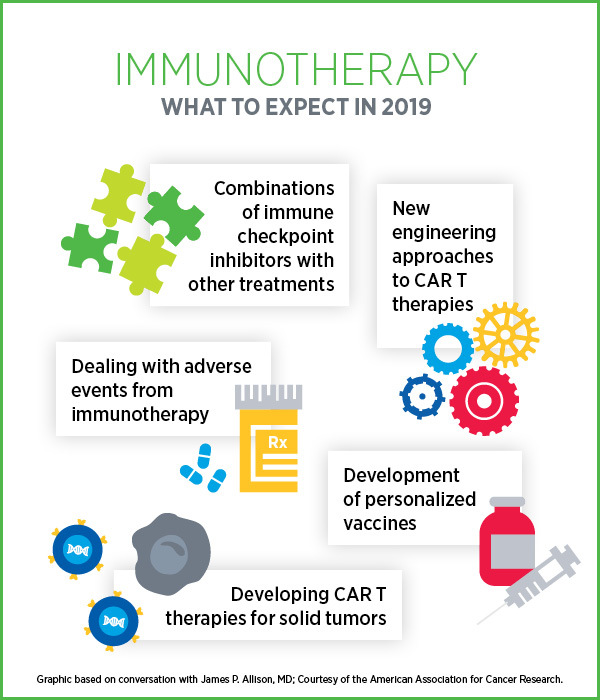 Another area of significant progress to expect in 2019 is the engineering of CAR T-cell therapies, according to Allison. “We might see more FDA approvals for blood cancers,” he notes. So far, the FDA has approved axicabtagene ciloleucel (Yescarta) for the treatment of certain kinds of non-Hodgkin lymphoma, and tisagenlecleucel for the treatment of certain types of leukemia and non-Hodgkin lymphoma. We can expect to see more engineering of CAR T-cell therapies to edit out genes that inhibit T cells, such as PD-1, or to introduce genes that code for the expression of certain cytokines or chemokine receptors, Allison says. “While I expect most efforts to continue to focus on blood cancers for the time being, we will also see approaches using engineered T cells to target solid tumors,” Allison predicts. We will also see more research utilizing proteomics approaches to find antigens and multiple targets co-expressed on tumor cells to guide the use of CAR T-cell therapies, he says. “In 2019, I hope we will see more studies to address adverse events that are associated with immunological treatment approaches,” Allison says. Understanding adverse events would require extensive analysis of patients’ data and studies of tissue biopsies, and he hopes we will make significant progress in this area. “The development of personalized cancer vaccines is likely to make a big impact this year,” Allison predicts, with more clinical trials, more studies of genomic sequencing for neoantigen prediction, and studies that address the best way to deliver peptide- and RNA-based vaccines. “I think this area is really going to take off in 2019,” he emphasizes. One major ongoing development is the extent of information generated through various genomic clinical assays for patients, Mardis says. While an important outcome of this is the development of therapies that target genomic alterations in the tumors, these initiatives also led to the recognition that certain germline defects can have therapeutic implications. One example is the alterations in the gene BRCA, which invoked the use of PARP inhibitors. Another example is the recognition that MSI-high tumors are indicative of potential response to immune checkpoint inhibitors. “A biggest challenge of next-generation sequencing (NGS) approaches that identify cancer genomic variants is that much of what we identify cannot be interpreted in terms of impact on function,” Mardis notes. For example, while we have gleaned the significance of certain BRCA mutations and can clinically interpret them, there remain many BRCA variants of uncertain significance (VUS). “The challenge created by this situation today can potentially be addressed using newer genome editing technologies for high-throughput functional studies that characterize VUS in a medical context,” Mardis says. Fortunately, the case for clinical utility of NGS cancer assays is clear and well established, such that many major medical centers are doing these tests routinely and are reimbursed in many cases. “The clinical utility is demonstrated, so the goal, moving forward, is to address the challenge of interpreting VUS,” Mardis opines. 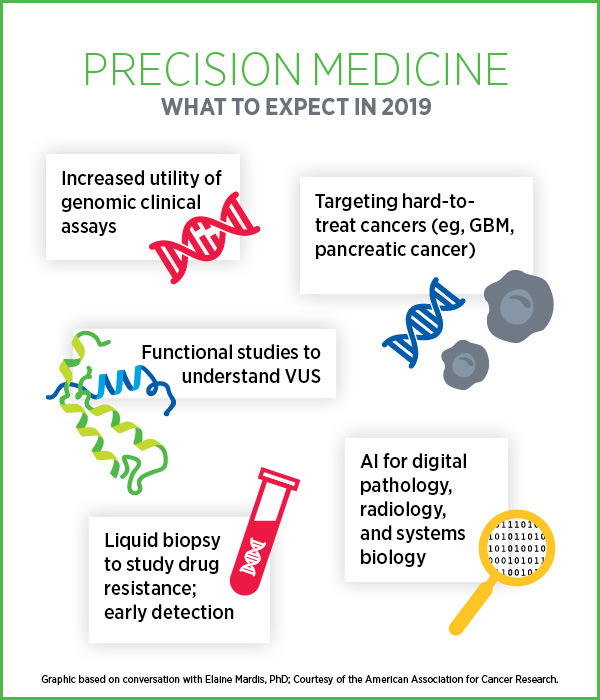 In 2019, we can expect to see more systematic studies that incorporate liquid biopsy-based treatment monitoring to study drug resistance in patients, especially in those with known mutations in their tumors, Mardis notes. Demonstrating the utility of liquid biopsy-based monitoring in detecting treatment resistance can be a stepping stone to use this approach for early detection, she adds. Mardis is enthusiastic about using artificial intelligence (AI) to aid digital pathology and radiology, but in the coming year, she foresees significant progress in utilizing AI in understanding cancer as a system. “I’m most optimistic about ongoing work across a variety of labs in utilizing AI to study cancer as a system. Some teams are starting to model the information that we generate about cancer systems biology towards the integrative evaluation of tumors,” she notes. “I’m excited about the progress we have made so far in our quest to be more precise in our treatment approaches,” concludes Mardis. “I realize that there are significant hurdles to overcome, especially with difficult-to-treat cancers, but I can’t help but think that with all the intelligence and acquired knowledge that we have today, and the combinatorial approaches to cancer treatment development being tested right now, that we will continue to be successful as we move forward. 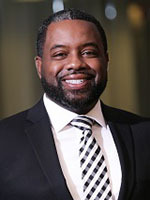 In 2019, we will see an increased focus on implementation science in the areas of prevention and cancer health disparities, says Rivers, who is director of Cancer Health Equity Institute at ​Morehouse School of Medicine in Atlanta. Rivers defines implementation science as the systematic study of methods to promote the adoption and integration of evidence-based practices, interventions, and policies related to public health, clinical practice, and community settings. “Implementation science seeks to understand the behavior of health care professionals and other stakeholders as a key variable in the sustainable uptake, adoption, and implementation of evidenced-based interventions and practices,” he explains. The same issues exist in the context of cervical cancer, where there are gaps in the utilization and uptake of HPV vaccination among different groups. “I think we haven’t really done a good job in terms of engaging all levels of the community,” Rivers says. “While a lot of the progress happens in the clinical setting, we haven’t focused enough on understanding the science of engaging the multiple levels that comprise the community. “This is important as medically underserved populations are less likely to have regular engagement with a healthcare provider and preventive health services,” Rivers says. “This year we will see more focus at the policy level as it relates to strategies that address cancer health disparities,” Rivers predicts. “The strength of implementation science is that it takes into account this complex dynamic adaptive system that can be a tremendous resource in guiding cancer health policies, and that’s what is truly needed in the cancer prevention and disparities space to make progress.” The AACR is currently leading the development of the inaugural cancer disparities progress report. This report will help educate the public and Congress on the current state of affairs in cancer health disparities and provide guidance in advancing health equity. Another area that will get quite a bit of attention in 2019 is the diversification of large databases, Rivers says. Experts in the field are employing strategies for the recruitment and collection of tumor samples from diverse patient populations for cancer genomics studies and ultimately molecular profiling. In March 2018, Morehouse School of Medicine witnessed the launch of an inaugural collaborative initiative known as 2020 by 2020. This initiative is a collaboration of the AACR with several partners, including Pelotonia, through The Ohio State University Comprehensive Cancer Center – Arthur G. James Cancer Hospital and Richard J. Solove Research Institute; and M2Gen and the Oncology Research Information Exchange Network (ORIEN). The goal of 2020 by 2020 is to perform genomic sequencing of tumor and normal tissue of 2,020 African-American cancer patients and aggregate clinical data from these patients by the year 2020 with the purpose of improving our understanding of cancer outcomes in this population. 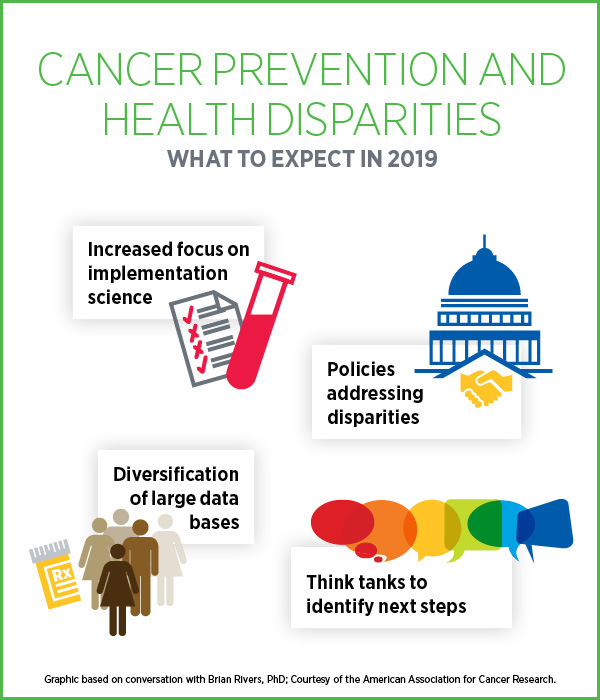 Rivers also draws our attention to the Cancer Health Disparities Think Tank that the AACR convened in October 2018, purposed to identify next steps in addressing cancer health disparities. Scientists were invited to speak on three priority areas with the goal of framing future research recommendations for cancer disparities. The priority areas were: increasing the participation of underrepresented populations in clinical trials, development of key resources to accelerate cancer health disparities research to understand the biological basis of disparities, and training the workforce to address cancer health disparities. 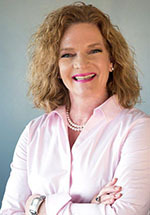 “These initiatives are critical to conducting important implementation science research, engaging the community, and ultimately advocating Congress on behalf of cancer research and making progress for cancer patients,” Rivers concluded.